Ultima Displays Canada, a division of the P3 Group, was established in Spring of 2002 in Markham, Ontario Canada. Its main purpose was to become the primary supplier of cost-effective portable exhibit displays to various trades and marketing agencies in Canada. By 2006, Ultima has grown exponentially and moved to 160 Cochrane Drive in Markham to a facility with larger warehouse capacity. In the same year, we established our own graphic department to meet the demands of our dealers and become the ‘One Stop Shop’ supplier of portable exhibit displays. In 2010, to meet the changing demands and display needs, Ultima expanded its graphics department and added a wide format Dye-Sublimation fabric printer along with additional Eco-Solvent printer. 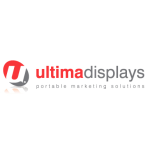 To this day Ultima Displays Canada continues to invest in product development and services with the objective of becoming the ultimate portable exhibit display supplier across Canada. Our mission at Ultima Displays Canada is to become Canada’s first choice supplier of portable exhibit displays and offer a vast product selection that meets the clients’ changing needs. We strive to continually provide quality products at competitive prices and exceptional customer service to all our dealers without compromising our integrity, respect, and social responsibility. We are committed to creating an enjoyable business experience for our dealers as well as our employees by creating a fun and open work environment in which they can grow. At Ultima Displays Canada we believe that, although alone we cannot solve the environmental issues we face today, we can certainly do our part and contribute to the best of our abilities. Doing something is better than doing nothing. Our products are modular, reconfigurable exhibit stands engineered from the start to be used over and over again. As the marketing needs of our clients evolve, so does the system to accommodate them. Even long after its useful life, our products are still environmentally friendly as 80% of the material we use is recyclable. The main materials include aluminum, fabric, plastic, and cardboard. In 2007, the global P3 group of companies have committed to taking our green practices a step further. While the group of companies is working towards improving their green practices our ultimate goal is to acquire ISO 14001 Certification, which is becoming the internationally accepted Environmental Standard, by the end of 2010. We are committed to being environmentally conscious and continually look to reduce our carbon footprint by implementing practices designed to minimize pollution and waste of natural resources.